I found the original recipe for these Chocolate Muffins (are muffins just cupcakes without frosting?) on the internet, looking for a recipe with oil instead of butter, and then tweaked it. These are fabulous! So rich and tasty! Highly recommended. In a large mixing bowl, combine all of the dry ingredients. Mix/whisk together until blended. Add water, oil, egg, and vanilla to dry mixture. Mix things together and then add the vinegar and mix until the batter is smooth and free of lumps. Line a cupcake tin with paper cups. Fill each cup 2/3 full with batter. 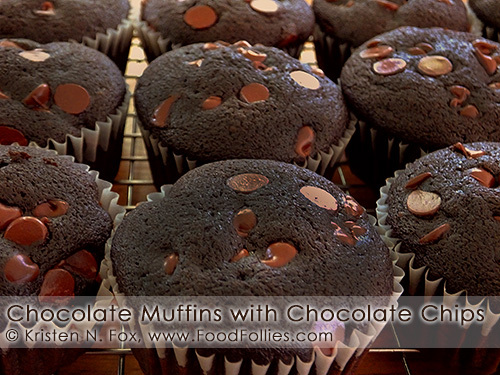 Sprinkle a few chocolate chips on top of the batter in each cup, about 8-10 chips per muffin. Bake at 350 for 20-25 minutes. Makes about 16 cupcakes. Mix pudding and cool whip. Microwave frosting for about 40 seconds. Combine the yeast, water and a pinch of sugar. Set aside to rise. Sift the flour and salt together in a bowl and set aside. Beat 4 eggs in a small bowl and set aside. Combine the warm milk and butter in a large bowl. Beat in the sugar. Add the yeast, then the beaten eggs and stir until well blended. Add six cups of flour, one cup at a time, mixing as each cup is added. When the dough is well mixed it should be soft and wet. Place dough on a flat surface and knead for 10 minutes, adding the remaining cup of flour as the dough and surface become sticky. Be careful to knead the dough in a consistent manner. Place the dough into a greased bowl and cover with a towel. Let dough rise rise in a cool spot until it has doubled in bulk. This should take at least three hours. Preheat oven to 350º. Push the dough down and knead lightly. Divide dough into four equal parts and form each into a round shape. Place each loaf on a greased baking sheet and allow to rise again until double in size. Beat the remaining egg and gently baste the loaves. Bake for about 30-45 minutes until golden brown. Start heating oven to 350 degrees, and grease a 9X5X3 inch loaf pan. Sift flour, baking powder, soda, and salt. With electric mixer at medium speed, or with spoon, thoroughly mix shortening with sugar, then with eggs, until very light and fluffy, about four minutes altogether. Then, at slow speed, beat in flour mixture alternately with bananas just until smooth; turn into pan. Bake 50 minutes, or until cake tester, inserted in center, comes out clean. Cool in pan ten minutes, then remove. Cool overnight before slicing.